Phytophagous insects are those that feed on plants. We see them all the time in our gardens on different plants. Different insects are attracted to different types of plants. For example, the tomato hornworm which is the larvae of the Five-Spotted Hawk moth (Manduca quinquemaculata) feeds on tomato leaves as their first choice. How do they choose their host plant? The adult female insect chooses the host plant before they lay their eggs. The adult insects (moths and butterflies) are beneficial pollinators but their larval form is very destructive to plants. Although the adult does not have the same diet as the larvae, it knows what its offspring will want to eat. There are cues that they use to choose their host. The first one is visual cue - they choose green (plants) instead of brown (soil). Once they are on the right color location they start to inspect the other details such as the chemical properties of the plants that they have chosen. Only after they have made sure that the location is right that they begin to check out the other details of the host plant. The scent, palpability, and taste of the plant will be final test on whether the insect will decide to stay. Otherwise it will continue to look for another plant until the perfect one is found. This is similar to house-hunting. First we choose the right location or city and then we look for the house that is affordable, with a big yard to garden, or a sparkling swimming pool. We view different houses until we make an offer only on the one that meets our requirements. The voracious larvae that are on my basil plants did not choose to be there nor did they migrate from another yard because they liked the good smell of the herb. They were left there by their harmless parents (moth or butterfly) who made sure that their young will be fully supported. Friends or Enemies? Well, a couple of days ago I wrote something about saving the pollinators. 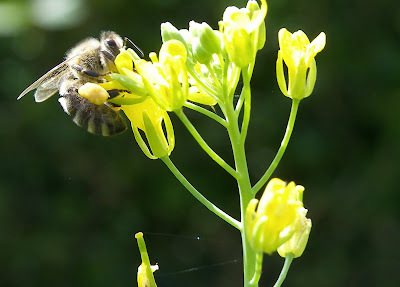 Now, I am talking about "future pollinators" eating my food. How then should we treat them - enemies or allies? No matter how I will answer this question it will always be wrong. The butterflies and moths are our partners in food production and they deserve to have food during the different stages of their life cycle. If we do not want them to feed on our own food then we need to make sure that they can find theirs somewhere. Therefore, diversify. We have enjoyed a lot of radishes this year. There are still some left of the 'French-Breakfast' variety in the garden which probably are too hard to eat now. So far the first sign of bolting has just started. I am curious to see how big they can get. For the other variety (round red) bolting has occured a long time ago - in fact pods have already developed. There are volunteer-potatoes growing in the vegetable garden. They are flowering which indicates that they are long-day plants. The leaves look green and healthy which means that the tubers underneath the ground are getting bigger. When the leaves start to turn yellow and brown that is the sign that they are about ready for harvesting. All the tomatoes are doing great. No diseases and pest so far. I planted three varieties: 'Better Boy', 'Early Girl', and 'Sweet 100'. These Zucchini are starting to flower although so far no fruit has set. That is not surprising at all. Fruits will come; I just have to be patient. We have a very generous supply of sweet basil this year. There's a whole plot in the garden and several of them planted in different pots. That way we can bring some of them close to the kitchen to make cooking more convenient, I guess. This is just a glimpse of what's going on in the garden at this time. It will serve as a reference when I make my plans for next year. The rose 'Zephirine Drouhin' is probably the only rose that would qualify to be planted in front of our house flanking our north-facing garage doors. When I planted them (three plants) my children were small and played on the driveway a lot. This rose is thornless and kids are safe around it. I purchased three of them in Petaluma about eight years ago. This old Bourbon rose is overwhelmingly fragrant. It produces clusters of stunning cerise-pink old-fashioned flowers throughout spring, summer, and fall. An excellent candidate to train on arbors, wall, trellises, or around pillars, it grows vigorously up to 10+ feet tall. The front of our house gets the sun the later in afternoon and yet this rose is doing just fine. Therefore, I can say that it can tolerate some shade. This rose is very responsive to fertilizer. A little complete fertilizer goes along way with this easy-to-grow and delightful rose. The problem I've noted with this rose is its tendency to attract aphids and its susceptibility to powdery mildew. It is possible that the mildew problem could be less in full-sun growing environment. Consider having 'Zephirine Drouhin' in your garden. She will surely delight you. In the course of any given season, we plant and water, we fertilize and weed but for most of our crops someone else has taken the responsibility of performing the key job that result in a good harvest. The pollinators are our partners in the backyard or in the fields. They are the bees, butterflies, hummingbirds, moths, flies, beetles, and bats. This week (June 21-27, 2010) has been designated as the National Pollinator Week by the USDA. This post is not that late - you still can check out their website and see what you can do. One small step at a time counts. As gardeners, we can make deliberate attempts to make our backyards a favorable habitat for pollinators. It does not take much from us to help improve this "world of pollinators". In my garden for example, I allow my herbs and vegetables (cilantro, parsley, sage, mint, rosemary) to flower. These are insectary plants - they harbor insects including pollinators. Now as the season progresses, the annual and biennial herbs dry out - but the bok choy (in the picture) and radishes which were purposefully left to flower are hosting the insects. These are just plants from my kitchen garden. There are so many ornamental plants that can provide pollen and nectar for them. Different plants attract different pollinators. Diversify your crops to provide a continuous food source throughout their active season. If you want to take action for pollinators there is a specific recommendation for your area. In food production, the pollinators are our allies. Transplanted pseudobulb with new shoots. New Growths on Pseudobulb. Pseudobulbs are the swollen orchid stems where leaves are attached to. When the leaves die and abscise during the season, pseudobulb is not relieved of its function. Leafless it may be it serves as a reservoir of water and nutrients for the plant. The picture you see above is a product my one mistake. I detached the pseudobulb from the plant and planted it to see if new plant comes out. This is not recommended since it would deprive the rest of the plants from the good stuff stored in it. My inexpensive potting mixture is working. Last May I experimented on the potting mixture that I used to repot the orchids. I observe that the plants seem to like it as indicated by the number of new pseudobulbs coming out. Spike is the term used to refer to the inflorescence or the flowers in cymbidiums. As a general rule, a spike comes out at the base of each new pseudobulb. If these plants continue with their current growth trend then I can safely say that you and I can save a lot of money by making our own cymbidium potting mix. Cooler spot. Cymbidiums love the sunshine but the blazing summer light intensity is too much for these traditionally-understory plants to bear. For now I have moved the orchids to a more shady part of the yard. The good thing about potted plants is that the microclimate can be adjusted easily by moving them around. The plum tree is laden with fruits this year. When plums ripen it happens in one week or two. It's very fast. Last week they were green with a tint of red on some of them. Now there's no turning back! They're ready. Plums can be harvested before they are totally ripe. They continue to ripen and get sweeter as they sit on the shelf - up to a certain point. Harvesting plums is one of the many fun summer activities in the backyard. I enlist my kids to harvest them. The tree is not very tall (it's only about nine feet) so they use a stool and an apple picker for the ones that are out there. These plums are very sweet and excellent for eating. These plums will be a juicy welcome to my two older kids and my husband when they come back from a mission trip. Ripe fruits are bluish in color. In case we fail to bring the fruits in, the Blue-Jay birds are more than happy to help themselves. I spotted two of them already circling the tree trying to stake their claim. Only a day or two to go before they're ready. With the way they look I might need to get my canning paraphernalia ready now. As mentioned previously, my rose 'Sally Holmes' has gone over my 10-foot tall patio cover. As a result it has been difficult to make a close-up appreciation of the massive bouquets that it produces. Although I used to cut the wedding-bouquet-like flowers to delight my children with, it's been a long time since I had the chance to touch one. Most of the time now the flowers are being ignored except for the constant reminders of their presence through showers of petals that are blown down by the afternoon breeze. Well, recently the rose sent out new canes from the base of the plant. It was amazing to see such flowers produced in an almost 1000-SPF-shade (meaning under a thick tree and the patio cover). Compared to their sun-kissed counterparts sitting over the shade structure, these flowers exhibited a more pinkish-coloration - which I think is more beautiful. 'Sally Holmes', based on my observations, is tolerant to some shading. In my garden. The avocado tree which was planted by my children for fun is now about nine-feet tall. It's been almost five years since it was a small seed but it seems as though it is not going to flower soon. I remember my grandmother saying that it takes seven years for an avocado tree before it starts to bloom. However, that might not be the case with this one. It is could be that it is an earlier variety than what my grandmother used to grow in the Philippines. The tree came from a seed that was extracted from a grocery-purchased fruit; it could have been 'Haas'. We will wait patiently to see what happens. My husband's grandmother who lives north of our place has an avocado tree growing against the back of her house but I can't remember seeing any fruit on it. On the other hand, I know that further south from our place is where avocados are commercially grown. So it looks like I have a fifty percent chance of actually seeing fruits from this tree. Fruiting or not, the tree itself is very ornamental. In the spring this evergreen tree starts to put on new broad leaves which are reddish brown in color with a sleek finish. It looks like a specimen tree. My peach tree suffered much from pest and diseases this season. Due to the prolonged period of rains, the tree suffered much from leaf curl (Taphrina deformans). Now there are galls on the twigs (see picture). The nature of these galls are unknown to me...if you know what they are please let me know. They look like dark brown shiny beads with starch-like substance inside. I have been doing research to identify them but I guess the most scientific step would have been to submit samples for pathological analysis. It is my guess that these are caused by the fungal damage from the leaf curl. Plant galls are not uncommon. They are likened to a tumor that results from abnormal cell growth due to irritation caused by insect infestation and fungal or bacterial infection. They grow on different plant tissues such as the roots, stems, branches, fruits and leaves. The nature of the gall is not only affected by the organism that is causing it but also the location of gall formation on the plant. Galls growing on leaves tend to be softer than those growing on bark of trees. Galls growing on hairy leaves tend to be fuzzy while those growing on the branches are hard and shiny (such as the ones in the picture). Although they look very severe, galls are not detrimental to the plant. They can interfere with the growth of the particular part where they are growing but not the whole plant. Since I am not sure of the true nature of these galls, I thought of removing them by hand to avoid further proliferation. Luckily they were concentrated in a couple of branches only. If you know what these are please let me know. Mastering Horticulture is listed as the most popular blog in DigInDirt.com today! Thank you folks for visiting! 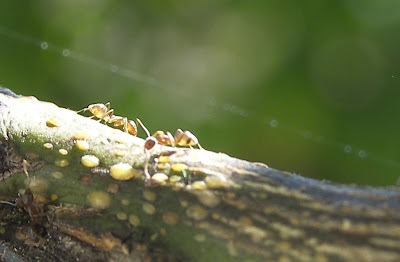 Ants tending scale insects on orange tree. Have you ever wondered what in the world are ants doing on your plants? Well, you might want to check their activities by following their trail. It is likely that they are tending some aphids or scale insects somewhere on your plants. This is the case with my orange trees that are in pots. Hidden from my eyes are pests that are being farmed by the ants. Slowly the aphids are sucking the blood out of my plants, and the ants feed from their exudates known as 'honeydew'. Ants consume the honeydew as an important source of their nutrition. 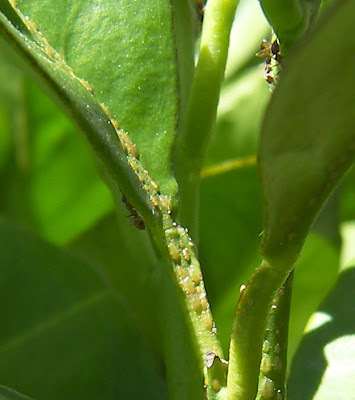 The aphids and scale insects in turn have a greater survival rate and thus increasing their population. As you can see, both aphids and ants benefit from this relationship but the plant is the victim. 1. They protect them from their predators - For example, ants attack lady birds. 2. They prevent the proliferation of destructive microorganism (such as molds) by eating the honeydew. 3. They hunt for a favorable shelter and feeding area on their behalf. 4. They move the nymphs (young aphids or scale insects) to better parts of the host plants. Ants cleaning/eating the wastes produced by scale insects. On the background is a spider web. It's a dog-eat-dog world out there. The ants might seem very powerful in this case but there are also other living creatures that are "farming" them. When I was scrutinizing my plants, I noticed that the ants were not the only indicator of the location of infestation. If you look at the picture above, you can see a spider web that runs along the branch where the scale insects are. Somewhere a spider waits for the ants to make a wrong move by stepping on its web. The ants might be powerful to scare lady birds away but once they step on a sticky web, then they become a prey instead of a protector. It turns out that spiders are our friends. The plums are gradually changing color. A promise of more "plum sauce"
The California sunshine continues to hasten the fruits to ripen. Thanks to sufficient rainfall - there's going to be a good crop this year. This 'Santa Rosa' plum produces sweet fruits that are excellent for eating. I can't wait! This was one of the many plants that got trampled and broken when we had to replace the broken fence along the south-western side of the yard. Fortunately, clematis 'Ville de Lyon' came back with no problem and it did not even seem like its growth was delayed by cutting back due to the mechanical damage earlier. This variety blooms on the current year's growth therefore flowering was fine as usual. Clematis 'Ville de Lyon' is an outstanding garden vine. It is fast growing and blooms profusely in the spring. For a draw-back, the vine seems to lose its older leaves later in the season exposing its unsightly legs. However, this would not have any negative implication in the presence of low-growing and shallow-rooted perennials around its base. It has long lasting flowers. Clematis 'Ville de Lyon' was named after an historic and enduring city in France. Clematis 'Ville de Lyon': Rounded petals with dark carmine-red edges. Clematis 'Ville de Lyon': Medium size flowers (4-5") with yellow-tip stamens. There have been some zucchini flowers in my garden but no fruit has set so far. When a baby zucchini appears, it is not a guarantee that a fruit will develop from it. Sometimes this is a disappointing phenomenon especially to new gardeners. Cucurbits have imperfect flowers. Flowers are either perfect or imperfect. Perfect flowers are those that include both pistil and stamen. Imperfect flowers on the other hand, are those include either a stamen (staminate or male flower) or pistil (pistillate or female flower) but not both. Zucchini, just like all other cucurbita plants, bears imperfect flowers. 1. 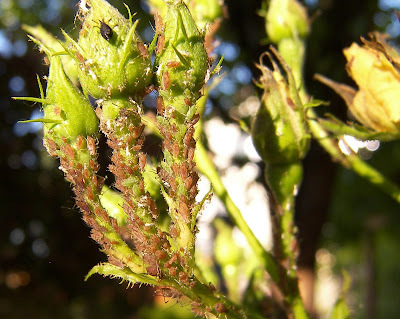 Dioecious plants are those that have either male or female flowers. In this case there need to be two plants of different sexes for pollination to happen. Examples of this type are holly (Ilex spp. ), willow (Salix spp.) and poplar. 2. Monoecious plants are those that carry the same sexes (pistillate and staminate flowers) in one individual plant. Good examples of this type of plant are corn, and cucurbits (cucumber, pumpkin, squash, and gourds, etc). Cucurbits are monoecious plants. They bear both pistillate (female) and staminate (male) flowers on the same plant. Pistillate flowers are those that have a miniature squash at the base although at this point it is still an unfertilized ovary. The squash will develop only when the pistillate flower is fertilized or pollinated. With the exception of the hybrid squash, cucurbita plants normally send out staminate flowers first. When the plants are well developed they will be able to support multiple flowers - male and female flowers opening at overlapping intervals allowing pollination to take place. Although the earlier flowers do not end up becoming fruits they are useful because they are like banners of invitation to the bees. The colorful flowers invite the busy pollinators to come and stay around. Zucchini: An example of a cucurbita plant. Understanding the growth habits of plants helps us explain some of our successes and failures in growing them. For the first time this year an orange color was spotted among the tomato vines. This is a very sure indicator that summer is fast approaching. Soon the tomato plants will be studded with this color but for now I have to celebrate the first hint of summer. Stroll in your garden and welcome the arrival of summer. The seed head is the fruit of the plant. The stringy parts are seed tails which are attached to the seed pod better known as achene. When the seeds ripen the tails change from sleek to fluffy. I could see how this would aid natural seed dispersal as they can be carried by wind just like dandelion (Taraxacum officinale) seeds. For clematis however, it is advisable to dead head them as it might lengthen their flowering period depending on other factors. Alpine strawberries of unknown origin and variety have grown in the yard as weeds during the previous years. The fruits are sweet and the plants are compact as they don't seem to have runners. My little Miriam loves to eat the fruits washed or not. Early this year I decided to cultivate them. From the different places where they were found growing, I moved them to one place of the yard. This way they would cease to be treated as weeds and be managed well to increase fruiting. Miriam would also be able to harvest enough in one place instead of having some here and there. They look very good, taste sweet, and smell fragrant. The problem - Miriam seems to have outgrown her interest in these strawberries. She doesn't go out and harvest them anymore but she still eats them when I collect them for her. Eaten or not the strawberries look very ornamental where they are growing now along a pathway. The birds also like eating them which was the initial reason they grew in my yard. Once they were weeds but not anymore. This plaque was given to me by my mother-in-law a while back. It has been in one corner of my garden ever since. What I didn't know is that the verse written on it is adapted from an old poem by Dorothy Frances Gurney. As I looked at this beautiful poem, it does not talk about the gardens that we grow in our backyards at all but rather the garden that God intended and designed for mankind. The garden described in the first stanza refers to the Garden of Eden where God placed Adam. It was a peaceful place very close to heaven. Adam and Eve allowed themselves to be defiled by sin - God's garden is off limits to sinful man. But that was not the end of it. God provided a way for mankind to be forgiven so that they could go back to His Garden. The garden in the last stanza speaks of Jesus Christ in the Garden of Gethsemane before he was crucified - the crucifixion that opens the gates for us, Adam's children, to enter the Garden once more. Read the poem for yourself and see what you can get out of it. If you are wondering why my blog looks different...it was not by design but rather an accident. After publishing my last post a window popped out into my screen and out of curiosity I browsed the new Blogger updates and checked out the new templates being offered. There was never any intention to change the appearance of my blog. Then my mouse directed the cursor to the forbidden button followed by an unintentional click that changed the face of my blog. The problem is the old is totally gone! Everything changed from the oldest to the newest post. Right now there are more important and fun things to do in the garden. Customizing my template will have to wait. Clematis. 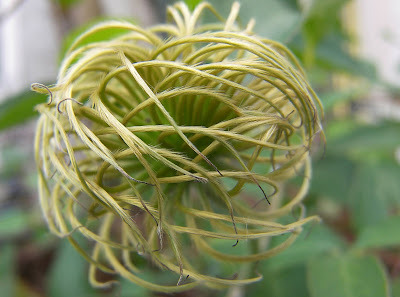 The time has come for Clematis 'Niobe' to shine as it rambles on a rose (Eden) whose flowers are now all spent. It comes out as a pointed bud and opens to stunning velvety red petals. The bright yellow stamens give a delightful contrast against the subdued red petals. I recommend clematis for every garden. It takes very little space to grow as it prefers to grow vertically and mixes well with other ornamental plants. There are hundreds of clematis varieties to suit every gardener's taste. I consider clematis a low maintenance plant. The area has had an unusually good dose of rain this year. Combine that with the warmth of the California sunshine and the plants can almost grow unhindered. I said "almost" because that same weather condition can also make pests grow almost unhindered. This year we had so many aphids - the lady bugs cannot keep up with their population growth. I had to rely on my handy dandy "dishwashing soap spray". Aphids like to feed on young and tender plant parts. They feed by piercing and sucking sap from their host. Unlike the chewing insects where the damage can be detected easily, aphids keep the plants intact but drain them out of the nutrients that they need. Regular close inspection gives us a better chance to eradicate them before damage is done. Cut close on the thin side of the seed to break the seed coat slightly. In the tropics where mangoes come from, seedlings can be found growing on compost piles or along sidewalks. The place is humid and hot that seeds thrown away can germinate voluntarily. Here on the other hand, the air is so dry that this recalcitrant seed has to be treated in a special manner for the seed to grow. This spring and all of summer we will be eating a lot of imported mangoes as usual. I thought that I would try to germinate some seeds and see if they will make a good houseplant. Avocados for example are sometimes treated as houseplants in places where they cannot grow successfully outdoors. The mango has a recalcitrant seed which means that it cannot withstand drying and freezing. The seed needs to be kept in a moist condition immediately after extracting the seed for the fruit. 1. Scrape as much pulp as possible from the seed using a knife. 2. Cut across the thin side of the seed to break the fibrous seed coat. This will reduce the length of germination period. 3. Wrap the seed with a moist paper towel to provide the moisture that the seed needs. 4. Place the wrapped seed in a clear plastic bag and seal it to prevent the paper from drying. 5. If necessary re-moisten the paper towel after a couple of weeks. Return to plastic bag until the radicle (the first root from a seed) starts to protrude after three to four weeks depending on temperatures. 6. Plant in a pot (1 gal). Keep it watered. The process will be long but once the leaves are out the plant will grow a lot faster. After three weeks inside the plastic bag, the radicle has started to grow. As soon as I see something happens, rest assured that I will let you know. I am really curious to see how mango seedlings do on this side of the globe. The rose 'Madame Isaac Pereire' in my garden technically belongs to my husband because he purchased it with his own gift certificate. He got it as a present from my mother-in-law. Originally we planted it close to the patio door where we could enjoy its fragrance easily. However, that place has become too shady so we moved it to another place for more sunshine. This rose is very beautiful with a deep and clear pink color. I wonder if this is not the basis of the true "rose pink" color. The plant is a shrub or a short climber. In my garden it has not proved to be a vigorous grower, so far. There seem to be more stems and branches showing than leaves. I am not sure if this is because of the location or my management techniques. This is to say that I have yet to see a beautiful plant not just flower in her (Madame Isaac Pereire). Rosa 'Madame Isaac Pereire' is an old Bourbon type rose (originated on the Île de Bourbon and first introduced in France). During the reign of Jules Grévy (French President of the Third Republic), the rose was hybridized by Garcon in 1881 in France but was first introduced in England. From there it was considered the most fragrant rose. With the amount of petals produced in every flower it became a prized material for potpourris which was very popular at that time. It was eventually named after the wife of a well-known Parisian banker. It is my observation that 'Mme Isaac Pereire' blooms on old wood. Pruning need to be done only to remove the spent flowers to maximize subsequent blooms. It also tends to produce beautiful hips (rose fruits) which may become competition for new flowers if not removed. On the other hand the hips can be a beautiful accent on the plant in the absence of flowers. Stroll in your garden and smell the roses. After removing the 'Cecile Brunner' rose that was growing over it, the Fuji apple tree is finally finding its corner a favorable place. It has set many fruits. This is a reliable indicator that the growing condition is good. However, five to six fruits per cluster are not all that good. It is more than one stem can successfully carry all the way to maturity. Fruit thinning needs to be done...soon. Fruit Thinning is the removal of excess fruit to ensure the development of quality fruits and to enhance repeat blooming. First of all, reduced number of fruits will result in less competition for the photosynthates and thus bigger fruits. This also allows the plant to allocate more food for the overall development of the plant. Lesser weight from several fruits will also lessen the load of a single branch and thus avoid unnecessary damage to the spur. Fruits that are touching each other encourage the spread of codling moth infestation into more fruits. As seen in the above picture, I lifted the other fruit away from the other one to expose the damage that has already been done on two fruits. If these fruits are allowed to stay the larvae inside the fruit will continue to make its tunnel all the way to the other fruits. Fruit thinning is such an important process in commercial production to regulate the quality of the fruits. In large scale apple production, fruit thinning is often done with the use of chemicals such as the insecticide carbaryl combined with the growth regulator NAA (Naphthalene acetic acid) applied at petal fall. For backyard gardeners like me, thinning is done by hand. Fruits are removed individually making sure to leave the best fruit in the cluster. Careful handling will also ensure that the chosen fruit and the fruiting spur are not damaged. So with regrets I will abort some of my apple fruits. 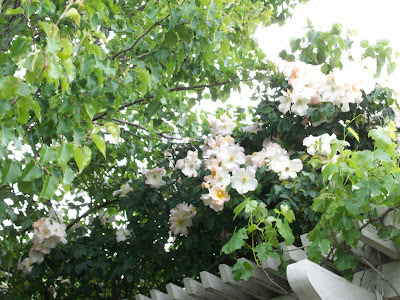 From a small bareroot rose that I planted in 2002, this Sally Holmes has grown into a huge plant that sprawls above my 10ft patio cover. The main trunk (cane) is now about three inches in diameter at the base. It once climbed on the columns of the patio but now it sits on top of it that I can only see the ones that drape on the sides. 'Sally Holmes' provides a beautiful shade in my garden. Sally Holmes was bred from the hybrid musk rose 'Ballerina' which can grow up to 6 feet tall and the Floribunda rose 'Ivory Fashion' which is a short (60 cm) shrub. Sally Holmes inherited the vigor from 'Ballerina' and the beautiful and more substantial flowers from 'Ivory Fashion'. It is vigorous, beautiful and adaptable. It has glossy leaves that stays green all year and hardly ever get diseases. The yellow stamens provide a beautiful accent in the middle of the white flowers. Sally Holmes produces clouds of flowers in huge clusters. One stem alone, when all the buds have opened, look like a full wedding bouquet. It is my observation that the flowers blooming in the shade are more pinkish in color. I like them that way because the ones exposed in the sun look washed out.